Vacuum sealer rolls are great for storing pretty much anything for long. So whether you want to keep your meats and veggies fresh in the freezer, or your dry beans weevil and mold-free and your duvet nice and clean and ready for your next guest, vacuum sealer rolls have you covered. Of course, these rolls must be used with vacuum sealers so be sure you have one before you buy them. You can select the rolls that best meet your needs. Looking for rolls for home or commercial grade ones? Remember, a nice bonus is that most of them are BPA free, as you will see. These are ideal for you if you are not a heavy sealer. If you’re a low to medium user, there is no point in buying a massive roll that will last for years and probably be obsolete before you use it all up. These 11” x 16’ rolls empower you to customize the length of your bags. So make them just short enough to accommodate your leftovers so that you don’t waste material. And make then just long enough to store whole fish, too. So provided the fish is less than 11” wide, you can stop worrying about “can’t fit” scenarios. The FoodSaver rolls are made of heat-seal bag material. Because these are sealed by melting them shut, they create a better airtight seal than zipper freezer bags. The bag is made of clear plastic, making it easy to identify what’s inside. No more guessing whether it’s broad beans or prawns! The white labeling area on each bag is great for writing the contents and date of storage. That way, the items are easy to find and retrieve from the freezer, pantry or kitchen cabinet. The roll’s multi-layer material is purposely designed to shield your food from freezer burn. This in turn keeps your food fresher for much longer (even years longer) than if you used an ordinary freezer bag. They are BPA free. BPA is a dreaded chemical that many scientific studies have linked to cancer. So, the further away your food is from this awful chemical, the better for your health! These vacuum sealer rolls are simmer and microwave safe, too. So they reduce your household chores as you don’t have to clean up too much afterwards. They are incredible time savers because you can batch cook your meals and freeze them which saves time because you’ll be confident that you’ll serve to your family just as fresh as a home cooked meal. These bags are versatile. They will store meat, fruit, veggies, dry foods (such as nuts and cookies) and even non-food items such as silverware, jewelry that is prone to tarnishing, and important documents such as passports. The 3-pack is far cheaper per role than if you bought each roll separately. These 11-inch-by-9-foot Seal-a-Meal vacuum rolls are designed for use with this Seal-A-Meal vacuum food sealer. Each roll’s made of heavy duty plastic and therefore keeps food fresher for longer by shielding it against freezer burn. So this is a good choice if you don’t want your cheeses, meats and vegetables – and the money you spent on them – to go to waste. Because each roll is made of strong plastic, it’s safe to microwave food in it. Just be sure to open about 2 inches of it to let the steam out. It’s also safe to boil food right in the bag. This is a 2-pack meaning that each of the above benefits are doubled. How’s that for an incredibly low price! If you’re looking for something more heavy duty, it might be a good idea to invest in commercial rolls. They are thicker (at least 3.5 mm). Many of the vacuum sealer rolls are also reusable after you have washed them. So what makes this sealer FoodVacBags rolls bundle the bestseller in the commercial roll segment? They give you the choice of 2 sizes. A width of 8 inches for medium sized items and 11 inches for extra wide items. They are heavy duty. With a 3.5 mm thickness, they will extend the shelf life of your food, whether you use them in the pantry, fridge, or freezer, where they greatly reduce the risk of that awful freezer burn. Their thickness also means they are versatile. So they can be used in the fridge, freezer and microwave. They can also be simmered in the pan. Because you have a 50-foot roll of storage material for each width, you can create custom-sized freezer bags that fit just right. They are reusable. Just be sure to wash them thoroughly first. And if you don’t like to get your hands wet, you’ll be pleased to hear that they are dishwasher safe. To be on the safe side though, remember to place them on the top rack. They are BPA free. So you can use them with full confidence that they are free of this notorious, cancer-causing chemical. With one crystal clear side, they are great for repacking and resale of goods. They are compatible with virtually all “clamp style” vacuum sealers. Each roll is 50 feet long and so will last and last. Plus your money is well-spent on the rolls, not on the fancy packaging. They are compatible with all leading clamp-style vacuum sealer bags. They are made of commercial grade material and will not tear at the slightest brush with rock frozen food. Their heavy duty material is excellent for locking in the food’s natural juices, nutritional value and flavor. It’s also excellent for extending the shelf life of your food. They are approved by the US Food and Drugs Administration department (FDA) to be safe for food storage. They are BPA free. So you can be sure that that dreaded chemical won’t leach into your food during storage, with potentially tragic consequences for your health. These VacMaster rolls are tough enough to withstand sub-zero freezing, microwaving and even simmering. With 2 identical packs, you effectively have 100 feet of material where you can make custom-sized freezer bags. So they can be as short or as long as you need them to be. These Vac Fresh 11" x 50' rolls (pack of 2) are both commercial grade and embossed. So they are both durable and appealing to the eye. They compatible with most of the leading brands of vacuum sealers. With a 3.5 mm thickness, they are a true commercial grade and won’t collapse under the weight of the items you store in. Certainly not as easily as the domestic grade vacuum sealer rolls. Both sides of the vacuum seal bag have cross venting channels that maximize air extraction. This in turn helps to keep your food fresher for longer whether you’re storing them in the freezer, fridge or pantry. The channels also prevent odor contamination – you don’t want your peas to have a fishy smell, courtesy of the sardines frozen next to them, do you? These Vac Fresh rolls are versatile and besides the freezer, fridge and pantry, they can be used to store silverware and keep your jewelry from tarnishing. They are BPA free so if your family’s health is important to you, you’ll want to invest in rolls that are free of BPA. They are approved by the US Food and Drugs Administration department (FDA) and are safe for food storage. They can be used to thaw or warm food in the microwave, or simmer food in the pan. They are also dishwasher safe. These vacuum sealer rolls are sold in pairs so you never have to worry about running out. Or ordering just one and paying shipping costs because the total cost will be below the minimum threshold for free shipping. 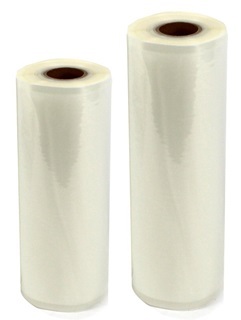 These two 11” x 50’ commercial vacuum sealer rolls will save you far more money than those designed for home use. These rolls can be used in all chamber sealer machines so if you own one of these, they are a great choice. They’ll lock in freshness, flavor and nutritional value of your frozen food while also extending its storage time considerably. They are made of heavy duty, commercial grade material and will keep your items safely. They are BPA free so this cancerous chemical won’t seep into your food and end up in your body! They are approved by the US Food and Drugs Administration department (FDA) and are safe for storing food. Because each roll consists of 50 feet of material, you can create a custom size bag each time, helping you to save plenty of bag material and money, too. For a clutter-free kitchen, it’s a good idea to wrap about 20 feet of material onto the old, empty roll core and keep this in the storage well of your vacuum sealer. Together, these 2 rolls give you 100 feet of vacuum sealing material. To put this in context, together, they would cover one third of the length of an American football field! If you find sous vide cooking especially convenient, you’ll be pleased to learn that these bags can be boiled or microwaved. They are that strong!